H is for Hearts of Palm…so what are these? Pretty much exactly what it sounds. Think of your Heart – your Center – your Core, that’s it. Essentially it’s the Core of a Palm tree that has been harvested – the inside ‘heart’ of the stem. They are probably easiest found canned in your supermarket. 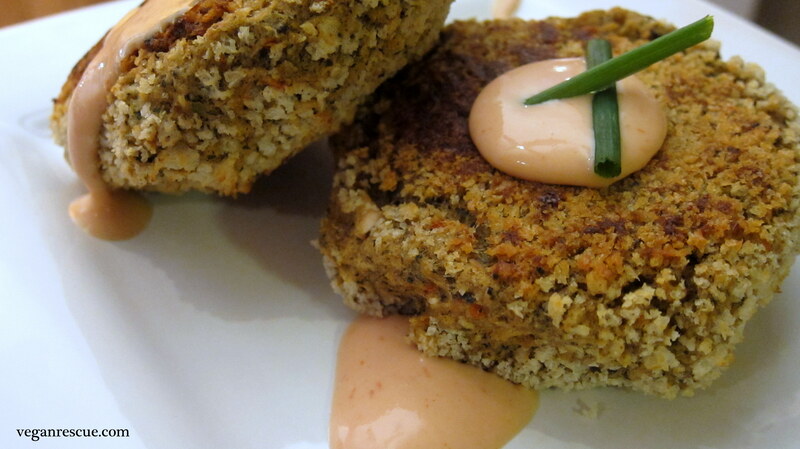 I was first inspired to try and create a vegan ‘crab’ cake after eating at a vegan restaurant in NYC called Blossom. Trust me their version is unmatched, I have no idea how they make it but it’s amazing. If you have the opportunity it’s a must try! Having no clue as to what ingredients they use or their technique or anything, I’ve tried my own versions over the years. 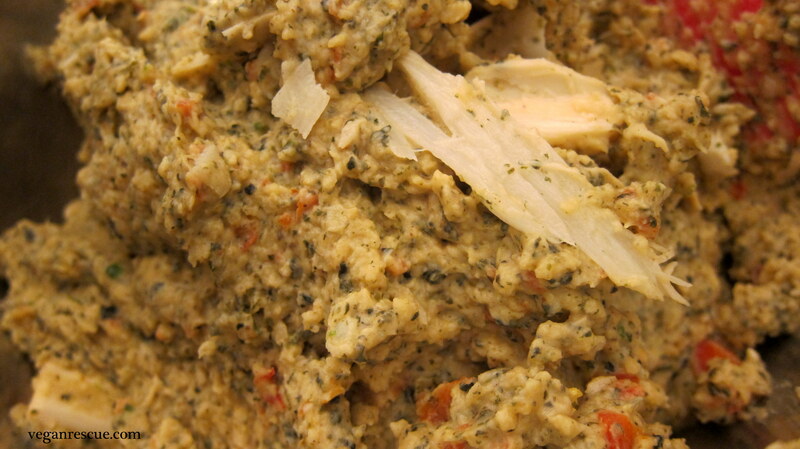 I’ve made this recipe several times in the past, my very first attempt years ago was horrid – I used way too much old bay; not sure what I was thinking. But over time I modified and made adjustments. Even with that said there are a couple variations I make of this recipe. One being that I’ll chop up the hearts of palm (so it mimics the appearance of crab) and fold it into the mixture. Second which is pictured, I’ll chop up the hearts of palm roughly then add to the food processor and pulse a few times to incorporate. The latter has the resemblance of a pate or ‘burger’ patty but the flavors are equally as intense. After rolling in additional bread crumbs and baked the outer appearance is still that of a crab cake, plus I prefer how the flavors are better incorporated/blended. Either way, this recipe is an explosion of flavors and instantly caused my mouth to gush with saliva as if I suffered from hypersalivation. Try not to drool! Enjoy. 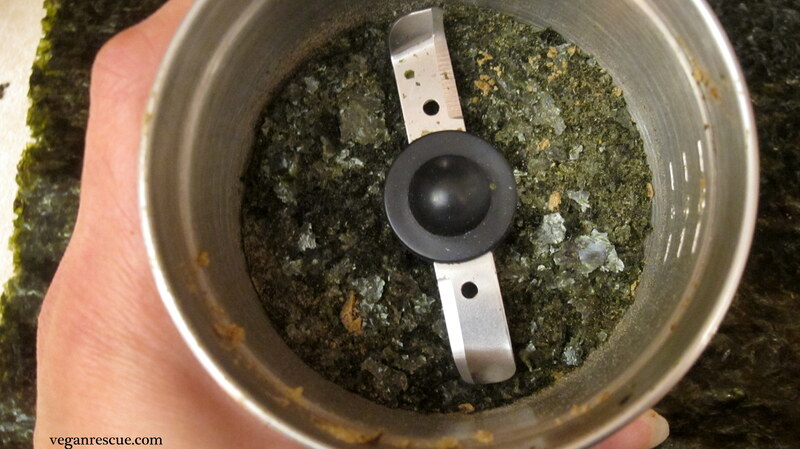 -Combine Nori sheets with 2 Tsp Old bay in coffee/spice grinder, divided. One Nori Sheet with 1 Tsp Old bay, set aside then the next sheet and tsp. -In Food processor, pulse together to combine: Butter beans, half of Nori mixture, Nutritional yeast, Red Pepper, Chives, Dijon, Sriracha, Potato starch and 2/3 cups of Panko. 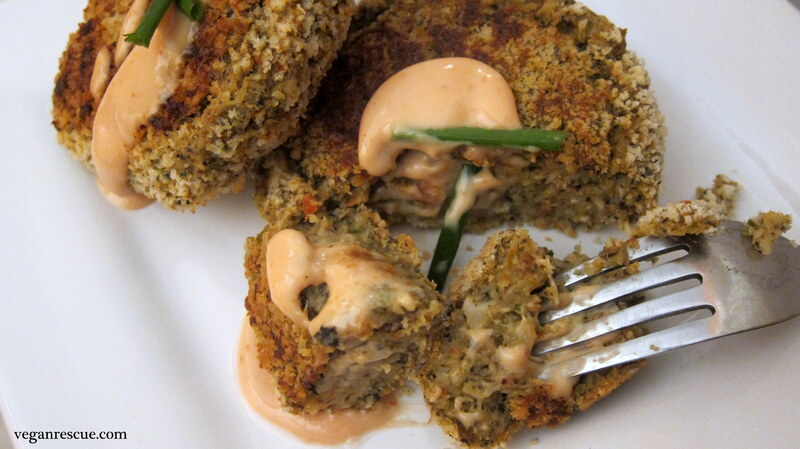 -To the above mixture (if you’re looking for a chunky texture) then turn out the above mixture into a bowl and fold in: vegenaise, salt, pepper, panko and Hearts of palm (chopped so the appearance is similar to crab meat). (If you’re looking for a smoother patty) to the mixture still in the food processor, add: Vegenaise, salt/pepper, panko and Hearts of palm, pulse a couple times to incorporate. 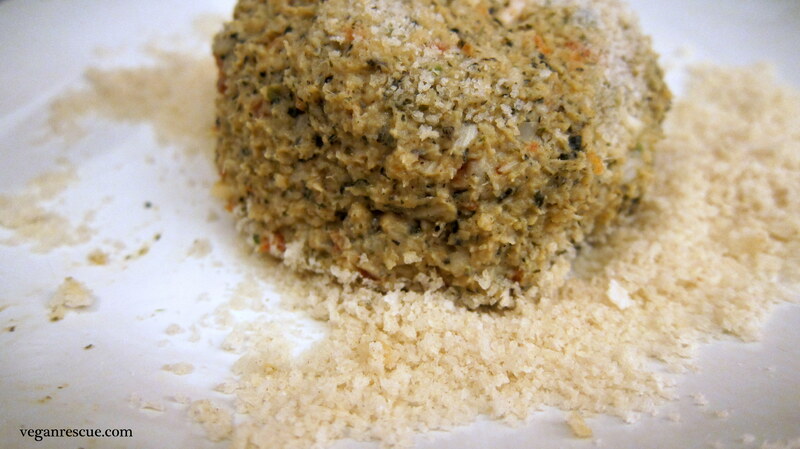 -Form patties and press/toss in remaining 1/3 cup of panko to cover exterior. -Bake for 25 minutes, I’ll flip them about ¾ of the way finished. Top with an aioli or sauce of your choosing and enjoy!